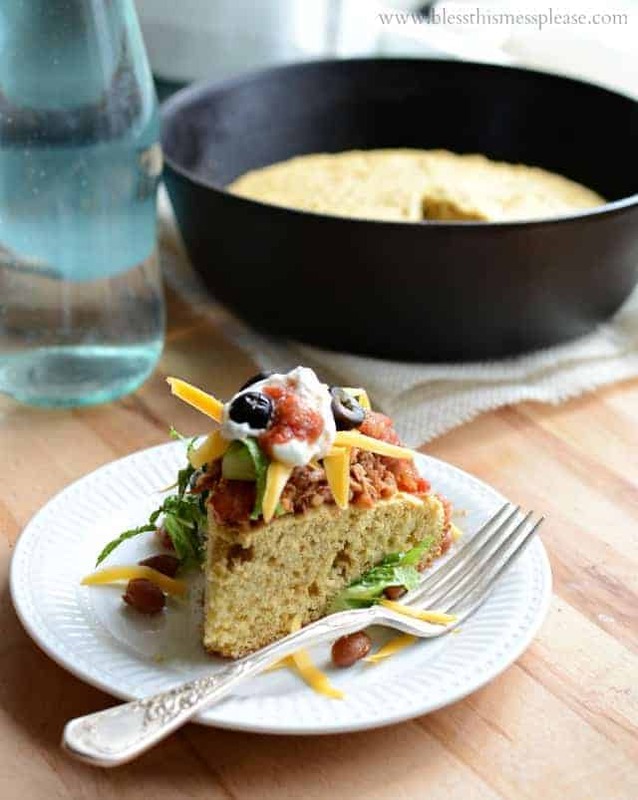 Quick, easy, and healthy whole grain tamale pie, made with whole grain corn bread and homemade chili. A warm, filling, and healthy dinner that can be on the table in about 30 minutes is my kind of meal. If you love all things Mexican like we do, then this will really be a hit with your family. 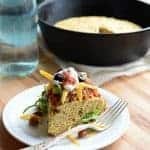 Healthy Whole Grain Tamale Pie is one of my favorite comfort foods from my childhood, and I know it will become a quick favorite in your house too. 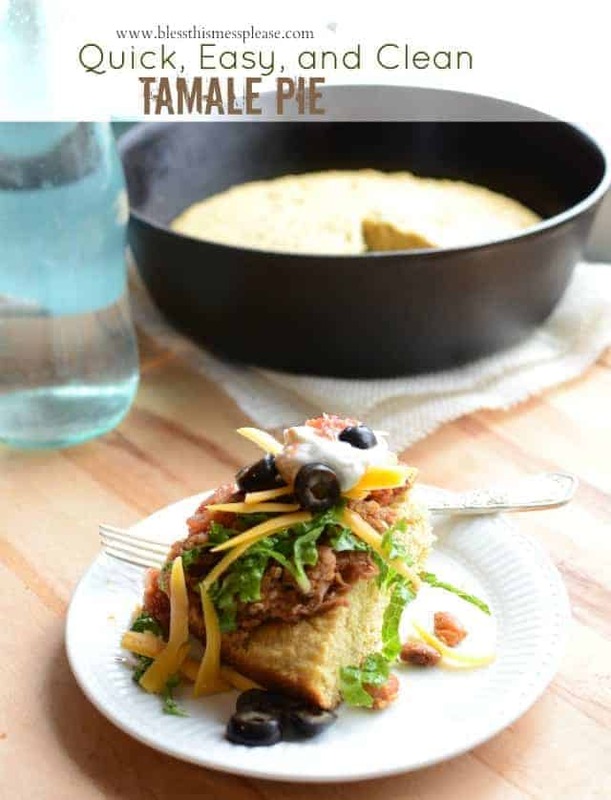 My beautiful mom made a simple version of this whole grain tamale pie using a Jiffy cornbread mix and a can of chili. I’ve recreated this favorite with a homemade whole grain (and naturally sweetened) cornbread recipe that takes 5 minutes to get in the oven, paired with a simple homemade chili. A few easy substitutions and I dare say you have a healthy homemade version that tastes even better. You can make the chili while the cornbread cooks and your kids can be busy cutting, chopping, or grating the toppings. If you need more healthy family friendly dinner ideas, you’ll love my e-book Real Food for Read Families. You can learn more about it here. While the cornbread is cooking make the chili. The chili recipe is more of a guideline. You can add a lot or take away a lot. Add a jalapeno to the bell pepper mixture of additional heat. Find diced tomatoes with cilantro and lime for added flavor. Use just about any meat you have leftover or leave it out all together. Use your favorite bean. Spice to taste. It’s very forgiving and easy to customize! How long does cornbread last? If stored properly, freshly baked corn bread will last for 1 to 2 days at room temperature. If stored in the fridge it will keep well for about a week. Cornmeal is needed to add bulk and density so corn flour is not recommended as a substitute. 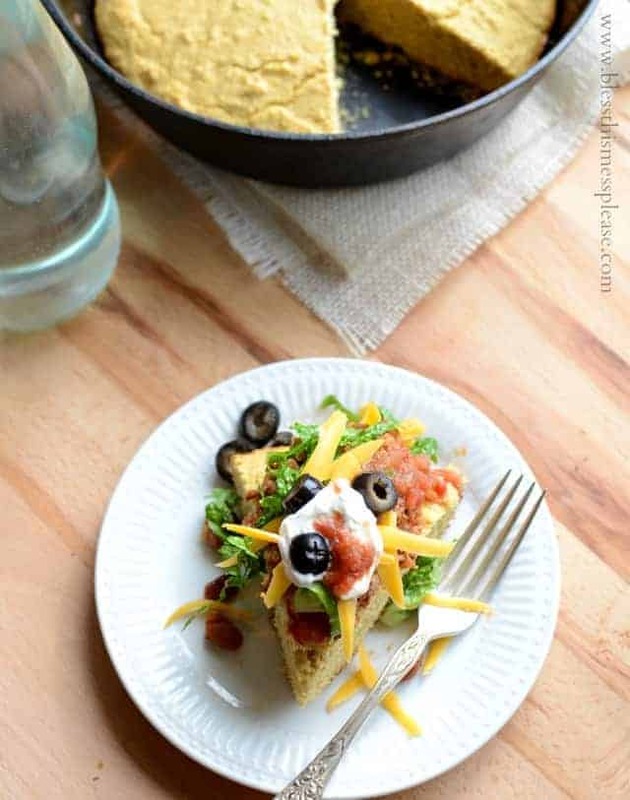 Quick, easy, and healthy whole grain tamale pie, made with corn bread and chili. Prepare and bake a batch of whole grain cornbread. While the cornbread is cooking make the chili. Saute the onion, pepper, and olive oil in a large skillet over medium high heat until the onion and peppers are cooked through, about 6 minutes. Add all of the other ingredient and simmer on medium low until the mixture is heated through and slightly thickened, about 15 minutes. 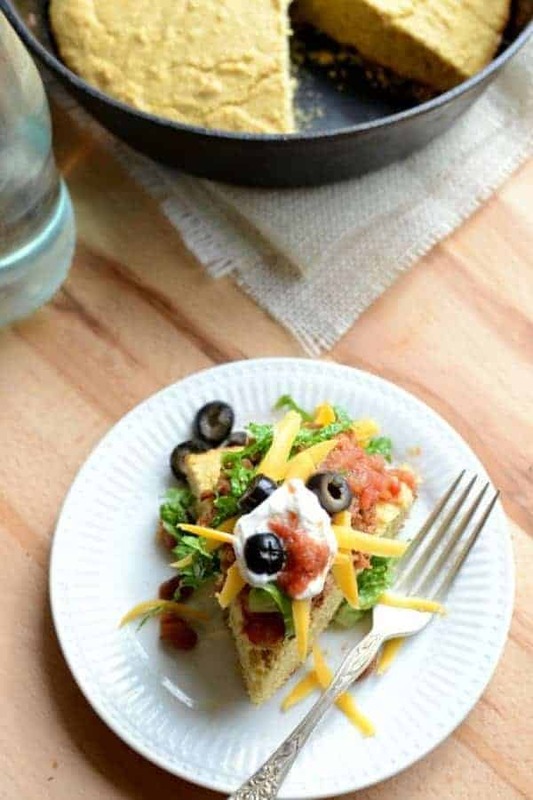 To assemble place a piece of cornbread on your plate, top it with chili, add your additional topping, and enjoy! I like to split my piece of cornbread down the middle so that it’s a thinner piece and then add the chili. Find a ratio that you enjoy! I think we like Mexican dishes so much is because they are easy to personalize and the kids love helping get ready for dinner. 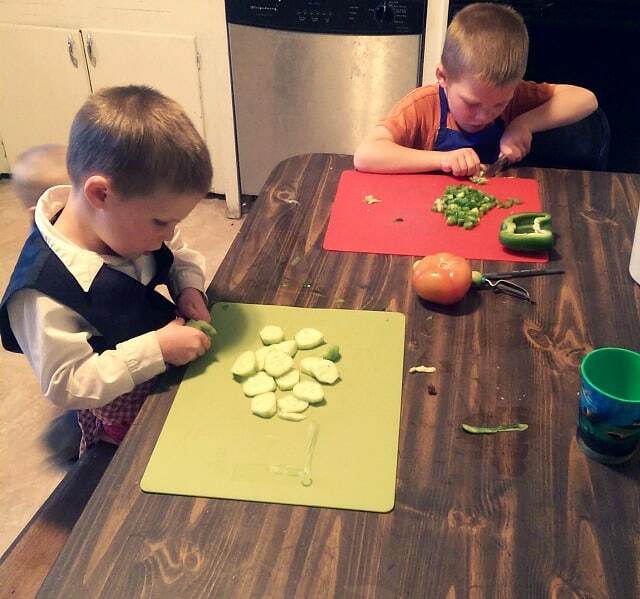 Here they are last night helping cut up topping for breakfast burritos! I wish the baby was in the picture because he wanted an apron on too and it was so cute. Henry at 5 is just getting responsible enough to use a small paring knife (and it’s a big deal when I let him use it; he feels so big), and Kimball (3) does well with the cheese grater, peeler, and a butter knife. It’s so fun to see them growing into new skills. And last but not least, I just have to say thank you for being here. I went to a blogging conference this weekend in Salt Lake City and I learned so much. One of my favorite takeaways was the feeling that this job of mine matters and that is because you are here. You are why I’m here. I’m feeling like I need to be more useful to you. What do you love to read? Lifestyle posts? Recipes? Anything new? I’d love for Bless this Mess to be just what you need it to be, so if you have suggestions, I’d love to hear them.